The new Mac Mini is a powerhouse, featuring up to a six-core i7 processor in a very small enclosure —that could lead to thermal constraints. AppleInsider strains the Mac mini, to see what happens when the machine is under load for a long time, and to see how bad the impact is on performance. Apple's Mac Mini is still the most inexpensive way to get a Mac, even though the base price is $300 more than the base model from 2014. Given the inclusion of four Thunderbolt 3 ports, it's a difficult compare to the cheapest Wintel hardware, and is price and performance competitive with Intel's NUC hardware for the first time. The six-core Core i7 processor can be had for as low as $1099, and we feel that this model will be very popular in the scientific community, and for users not afraid to add external storage and add their own RAM. But, like the Core i9 in the MacBook Pro, that is a lot of heat in a very small enclosure when under load. So, like with that MacBook Pro, we ran some tests to see how thermally constrained the enclosure is. Our test unit has 256GB of NVMe storage, and 32GB of RAM, retailing for $1899. In Geekbench 4, our test model scores 25,406 points in the multi-core test, which for what is likely the intended market is probably the best comparison of performance. For context, the 2018 15-inch i9 MacBook Pro retailing for $3099 at a minimum scored 22,574 and the $4999 iMac Pro scores 30,719 points. Unfortunately, graphics performance is where the Mac Mini suffers, as the graphics chip is built into the processor, unlike the 15-inch MacBook Pro and the entire iMac line which boast dedicated graphics chips. In Geekbench 4's Metal test, the Mac mini scored 24,962, compared to 44,308 on the base 15-inch MacBook Pro and 155,232 on the base iMac Pro. We see the same results in Unigine's Heaven benchmark, where the Mac Mini scored 193 points compared to 450 on the MacBook Pro and 1,831 on the iMac Pro. 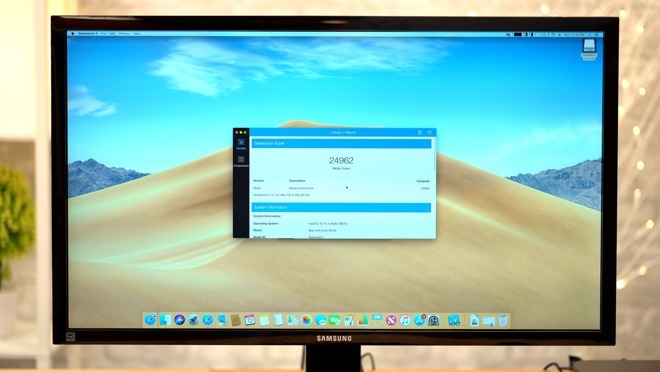 Luckily, the Mac mini has four Thunderbolt 3 ports so you can easily connect an eGPU that's even more powerful than the graphics in the MacBook Pro for less than $500 more. For about a decade, Intel processors have had two speeds —a base speed, and a higher "turbo" speed that the chip can maintain as long as thermal conditions allow. Processors also have a rated thermal design profile, based on the heat that the chip generates when at the base speed. Processors meant for desktop computers can afford to have a higher TDP, while notebooks, mobile devices, and tablets tend to use processors with lower TDP values, due to the difficulty of cooling the chip down. Apple has chosen to use a desktop chip —the i3-8100H, i5-8400B, or the i7-8700B, depending on model. While a processor is cool, it will exceed its base clock speed up to its boost speed. This generates more heat, of course. As that heat builds faster than a cooling system can remove it, the processor will slow down to help dissipate the heat in conjunction with the cooling system. It can even go lower than the normal operating clock speed if need be to prevent damage. We tested the i7 Mac mini using the same exact CPU stress test that we ran on the 2018 i9 MacBook Pro. We ran Cinebench R15 5 times back-to-back without letting the processor cool down, while also looking at the processor's clock speeds and temperatures to see if it's throttling. The Mac mini was well-ventilated without a fan blowing on the exterior of the case at all. The office was a steady 21C throughout the duration of the test. 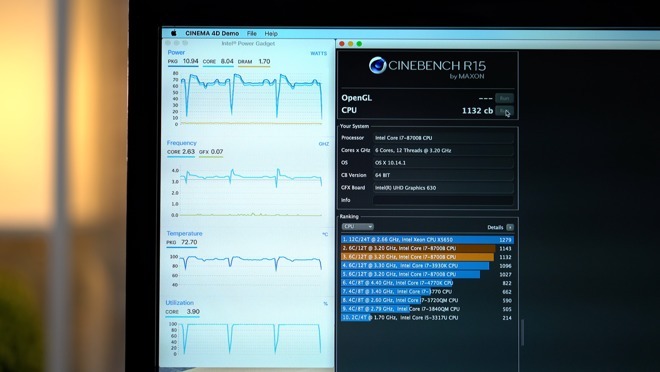 Shortly after starting the first test, the CPU clock speed shot up to a maximum of 4.26GHz. Shortly thereafter, the temperature hit 100C, with a drop in clock speed maintained at 3.5GHz, still above the 3.2GHz base clock. It finished the first run with a score of 1188. Some time after starting the second run, the clock speed dropped below 3.5GHz, showing that the processor is starting to slow itself down a bit more to keep temperatures down. It finished the second run with a score of 1144, 44 points less than the first run, demonstrating the effect of the thermal routines on completed jobs over time. After starting the third run, the clock speed dropped to 3.4Ghz quicker than in previous runs and hit a low of 3.3 GHz for a brief period. The third run generated a score of 1134, only 10 points lower than the previous test. For the fourth run, we noticed the clock speed maintained a range of 3.4GHz and 3.5GHz before finishing with a score of 1103 points. While the score dropped from 1188 to 1103 from the first to the fourth run, there is clearly some effect from the thermal control, albeit a small one of about 7.6 percent. Our fifth run scored 1132 points, a bit higher than the fourth run. Going back to older testing, with the i9 MacBook Pro, our first run's score was 1051, our second score was 978, and our final score was 1011, showing similar thermal throttling characteristics after Apple updated the firmware shortly after launch. We repeated the test with a i3 Mac mini with 8GB of RAM and 128GB of storage, plus another i7 Mac mini with 8GB of RAM, 128GB of storage, and an external Vega 64 GPU connected through Thunderbolt 3 with similar percentage drops over time, suggesting that eGPUs or the slower i3 processor have little effect on the thermal condition inside the case. Fan noise for all three units was noticeable in a very quiet office, but still subdued. Most eGPU units we've tested, bar the BlackMagic, are louder under load than the Mac mini was. From a simple, binary, "yes or no" perspective, the Mac mini clearly throttles based on the thermal condition. But, this is not a "gate," conspiracy, or anything of that nature. Everything with an Intel processor will adjust speed based on the thermal condition, with the severity of the slowdown and impact on performance depending on how much money you've invested into a cooling system if you've built the machine yourself. All this said, we're impressed with how the performance on the Mac mini held up as the job progressed and time ticked on. The clock speed averaged out at around 3.4GHz to 3.5GHz under 100 percent CPU workload with the i7 models, but at no point did it drop below the 3.2GHz base clock speed —making it a solid performer even when under load for a long time. 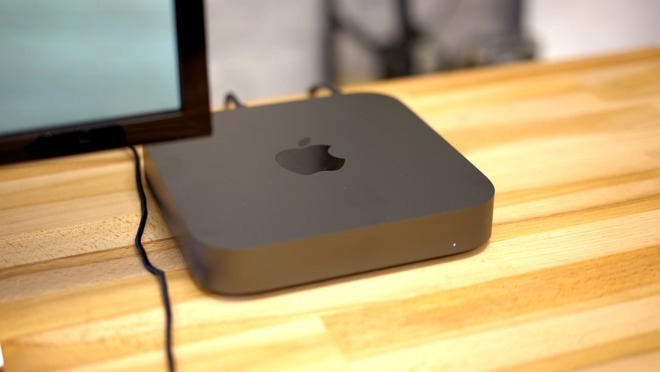 Apple's 2018 Mac mini is available for purchase at Apple authorized reseller Adorama with no sales tax collected on orders shipped outside New York and New Jersey. Orders are shipped on a first come, first served basis and your cart will not be charged until your Mac mini is ready to ship. For a full list of deals and product availability across multiple Apple authorized resellers, be sure to check out our 2018 Mac mini Price Guide. And for more information on how to save up to $310 on Apple's new hardware at Adorama, check out our buyer's guide.